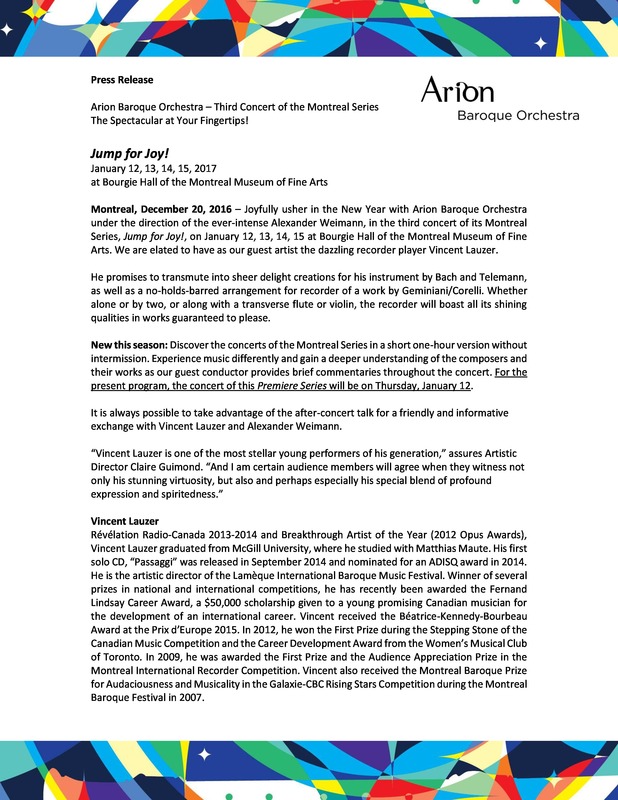 Montreal, January 3, 2017 – Joyfully usher in the New Year with Arion Baroque Orchestra under the direction of the ever-intense Alexander Weimann, in the third concert of its Montreal Series, Jump for Joy!, on January 12, 13, 14, 15 at Bourgie Hall of the Montreal Museum of Fine Arts. We are elated to have as our guest artist the dazzling recorder player Vincent Lauzer. He promises to transmute into sheer delight creations for his instrument by Bach and Telemann, as well as a no-holds-barred arrangement for recorder of a work by Geminiani/Corelli. Whether alone or by two, or along with a transverse flute or violin, the recorder will boast all its shining qualities in works guaranteed to please. New this season: Discover the concerts of the Montreal Series in a short one-hour version without intermission. Experience music differently and gain a deeper understanding of the composers and their works as our guest conductor provides brief commentaries throughout the concert. For the present program, the concert of this Premiere Series will be on Thursday, January 12. It is always possible to take advantage of the after-concert talk for a friendly and informative exchange with Vincent Lauzer and Alexander Weimann. Révélation Radio-Canada 2013-2014 and Breakthrough Artist of the Year (2012 Opus Awards), Vincent Lauzer graduated from McGill University, where he studied with Matthias Maute. His first solo CD, “Passaggi” was released in September 2014 and nominated for an ADISQ award in 2014. He is the artistic director of the Lamèque International Baroque Music Festival. Winner of several prizes in national and international competitions, he has recently been awarded the Fernand Lindsay Career Award, a $50,000 scholarship given to a young promising Canadian musician for the development of an international career. Vincent received the Béatrice-Kennedy-Bourbeau Award at the Prix d’Europe 2015. In 2012, he won the First Prize during the Stepping Stone of the Canadian Music Competition and the Career Development Award from the Women’s Musical Club of Toronto. In 2009, he was awarded the First Prize and the Audience Appreciation Prize in the Montreal International Recorder Competition. Vincent also received the Montreal Baroque Prize for Audaciousness and Musicality in the Galaxie-CBC Rising Stars Competition during the Montreal Baroque Festival in 2007.